This collection of block-colour and border plantings were in the park in front of the Azimut Hotel in St. Petersburg, Russia. This photo is taken from an upper floor of the hotel. Some of the plants were coleus, impatiens, Jacobaea maritima (dusty miller) and babys breath. The combination of various shades of red along with the very bright green creates a colour clash. The design of the garden plots is unusual. The purple and red plots at the top show some coherence in being outlined in the grey of the dusty miller. The remainder of the plots have no unifying theme or pattern. 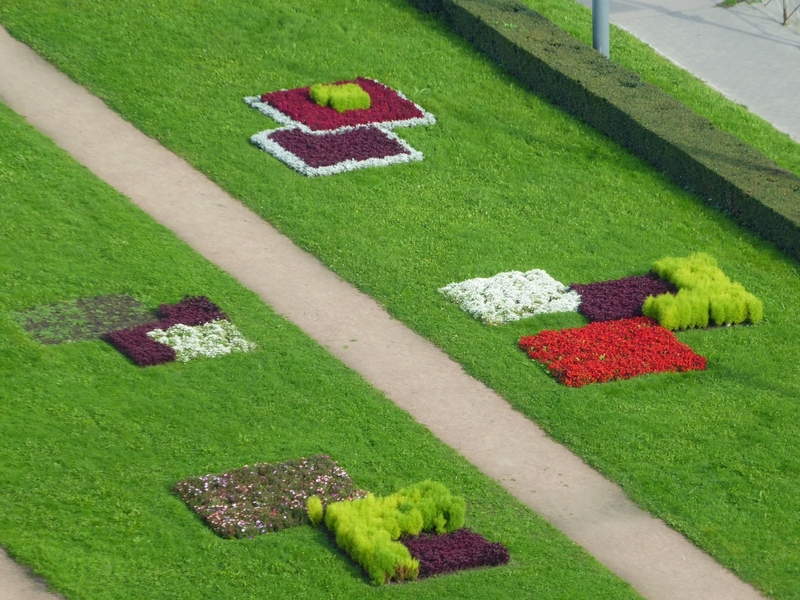 This random geometric placement of solid colour flower beds was apparent in other public parks in St. Petersburg.